Now, we’re not tax experts, and we hate to be the bearer of “bad news,” but tax time is almost upon us. 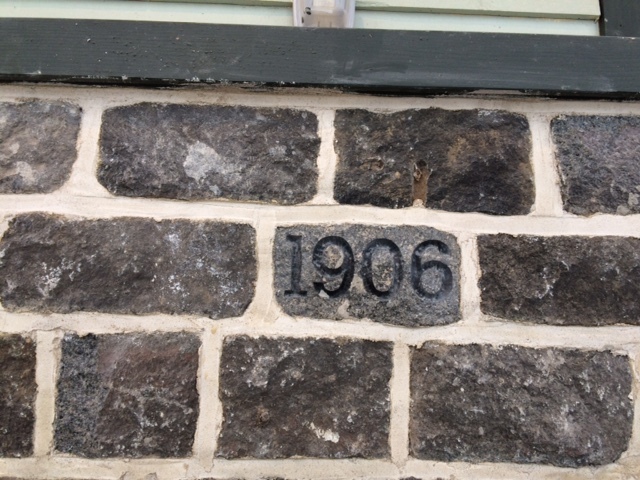 So if you need tax deductions to offset income, let’s discuss how you can help the restoration effort at Freeman Station, memorialize a family name or a specific family member, fund a memorial Whinstone, or otherwise set up a tax-deductible donation for tax year 2016, and make a lasting contribution to the Friends of Freeman Station’s efforts to restore/renovate/manage an important historic landmark in the City of Burlington. YOU can make a difference and leave a lasting legacy for this community, and deduct 100% of your contribution off your income tax return. Yes, there are many tax-deductible funds appealing to you for a donation, but none offers a more intimate and meaningful opportunity to do something to preserve a piece of Burlington’s early days, make a niche for your family surname, honour an ancestor, or just make a darn good gesture for your Burlington neighbours. Even a contribution which establishes naming rights to a certain facility or feature within the Station can earn you a receipt for a 100% tax deduction. Email info@freemanstation.ca to get started. 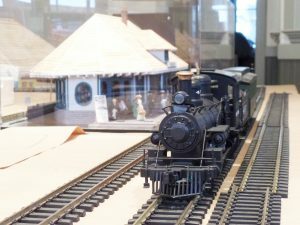 On Tuesday, November 15th, BDRC team members were invited to present our vision for the historic Lower Level Railway Diorama which we are planning to build in the basement of the Freeman Station to depict life in the hamlet of Freeman and surrounds in the 1920’s, to the Peel Scale Modelers (PSM) monthly meeting. We invited PSM to join us in the design of the diorama, the state-of-the-art audience involvement features we are planning (including lighting, sound effects, and computer control), and construction of specific models, buidings, vintage autos, horses and wagons, and early Twentieth-Century scenes which we will depict as the diorama grows and evolves over the next several years. We were greeted enthusiastically by the more than 30 attendees, and several came forward to offer help. Thanks, Peel Scale Modelers! 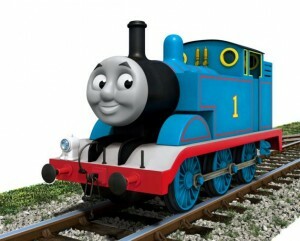 Please email info@freemanstation.ca if you would like to get involved, or would like to contribute. Thanks, Pauline, for your many hours of research and preparation to bring this image of life around the Burlington Junction Station in Freeman back to life. As a non-profit corporation, Friends of Freeman Station held its Annual General Meeting of members and interested friends on Wednesday, October 12th. Agenda included reports of the Executive, election of Directors, and other business. 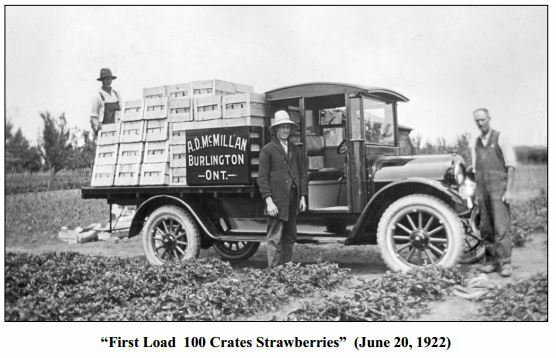 Friends of Freeman Station has received a generous donation from Burlington's Mikalda Farms Ltd. (Norton family) to sponsor the passenger Waiting Room at the restored Burlington Junction Station in memory of their McMillan ancestors, Alexander Donald and Charlotte Campbell McMillan and their descendants, including daughter Effie McMillan, and her son Frank McMillan and wife Lillie May Boniface McMillan. The "McMillan Room" Waiting Room at the Freeman Station will be available as meeting space for use by small groups. Completion of its restoration to early Twentieth-century appearance is now assured, and is almost finished, including newly paneled and painted walls, flooring, restored ceiling treatment, and reconstruction of the original windows including the distinctive Jane Irwin oval window at the end of the room. Our thanks to the Norton family for their generous support. 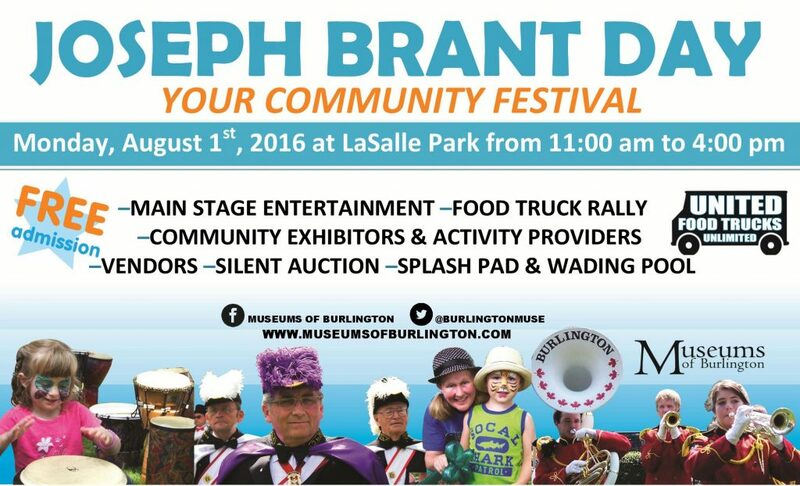 Friends of Freeman Station is coming to the LaSalle Park Pavillion on Monday, August 1st for Joseph Brant Family Day, 11 AM – 4 PM. Something for the entire family. Join us for an update on the Friends of Freeman Station project to restore the 1906 Burlington Junction Station. 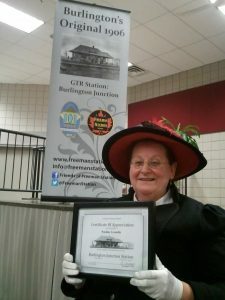 Special treat: renowned story-teller Pauline Grondin relates the history of the Burlington Junction Station and its importance to the Freeman / Burlington community. Children 12 years and older would probably enjoy the story with their adults. Colouring books for the youngsters, too! 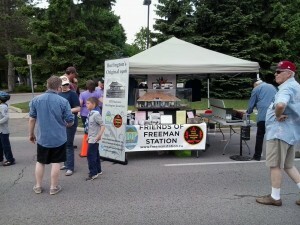 Friends of Freeman Station volunteers are needed for each of our Volunteer Work Saturdays in July. You can help, 8 AM til mid-day. July 9, 16, and 23rd. Wear old clothes. Current tasks are mostly focused on painting, but if you’re not a painter, there are other things you can do. Moral support is helpful, too, so stop past to say hello. 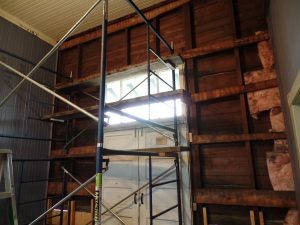 John calculates that more than 3,500 volunteer hours have gone into the Burlington Junction Station restoration project in the past two years. Our cadre of volunteers are virtually all young-at-heart seniors. The Waiting Room is almost finished. Prepare to be amazed. 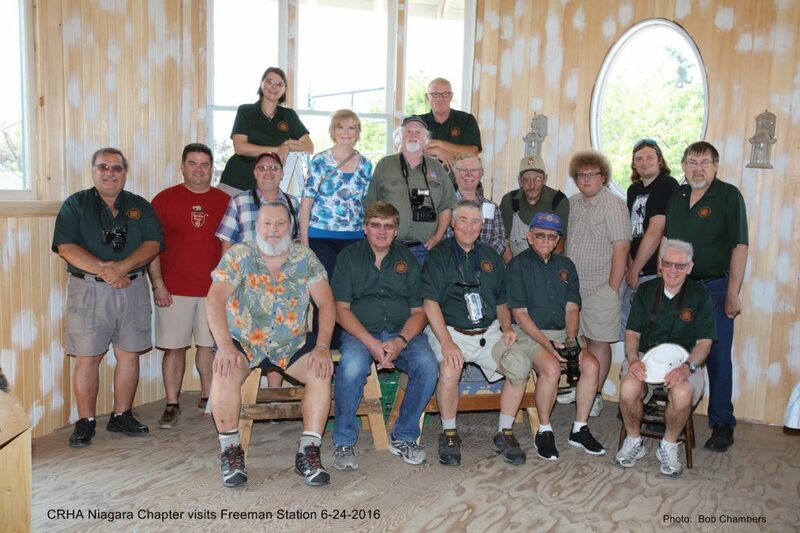 Bob Chambers captured their inspection of restoration progress at Freeman Station. 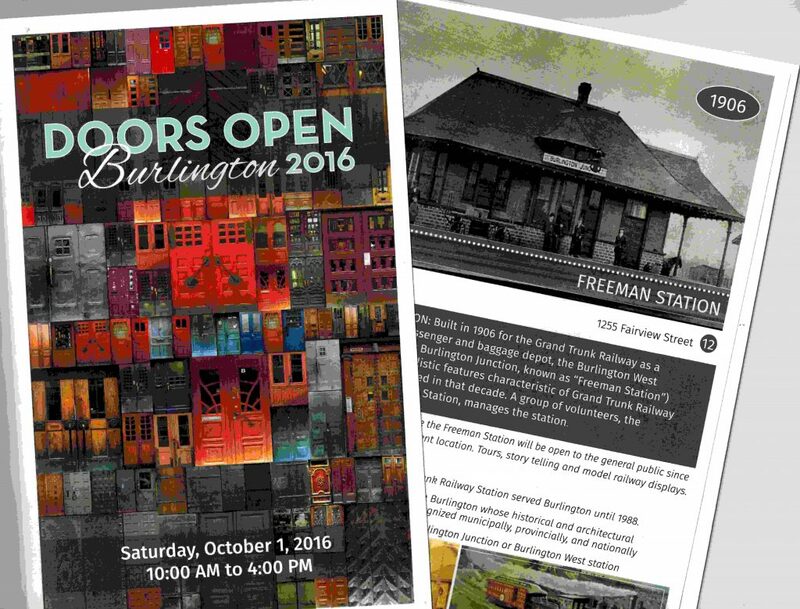 We’re excited to be part of Doors Open Burlington activities slated for Saturday, October 1st. 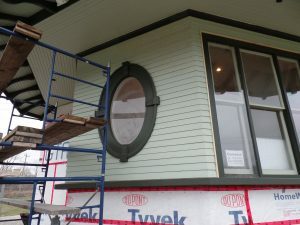 It’ll be our first opportunity to open the Burlington Junction Station to visitors, to show the progress toward restoration to an early Twentieth-century state. Mark your calendar for an enjoyable day! We’re at 1285 Fairview Street, next to the Central Fire Station (also a Doors Open location).